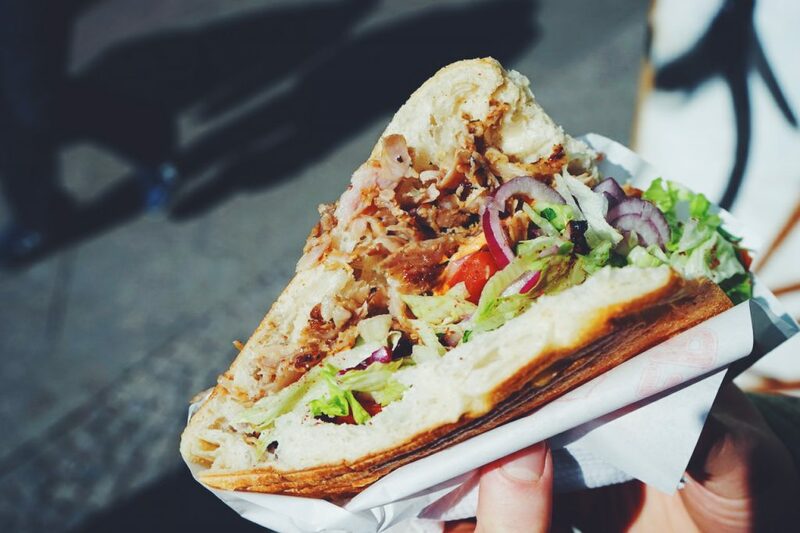 The Döner Kebab is the number one fast food of Berlin and a must try for every visitor. 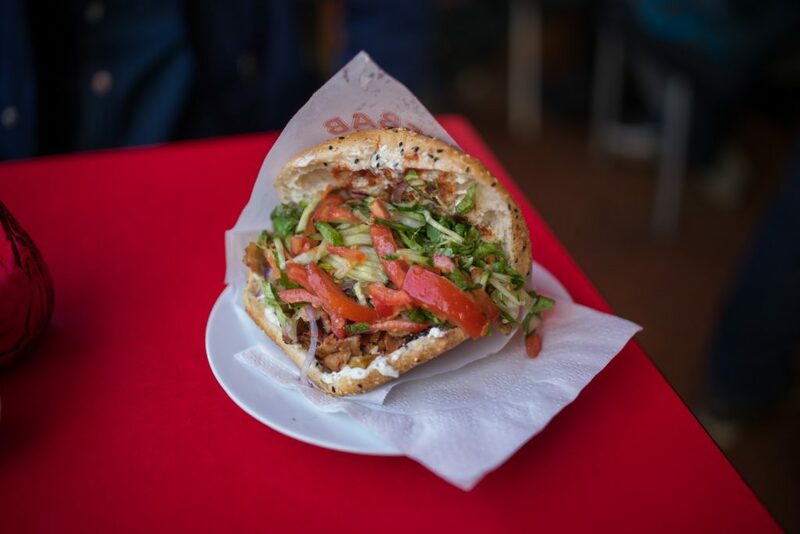 Behold the ultimate top list that summarizes the currently five best Döner kebabs in Berlin and helps you avoid any tourist lines. 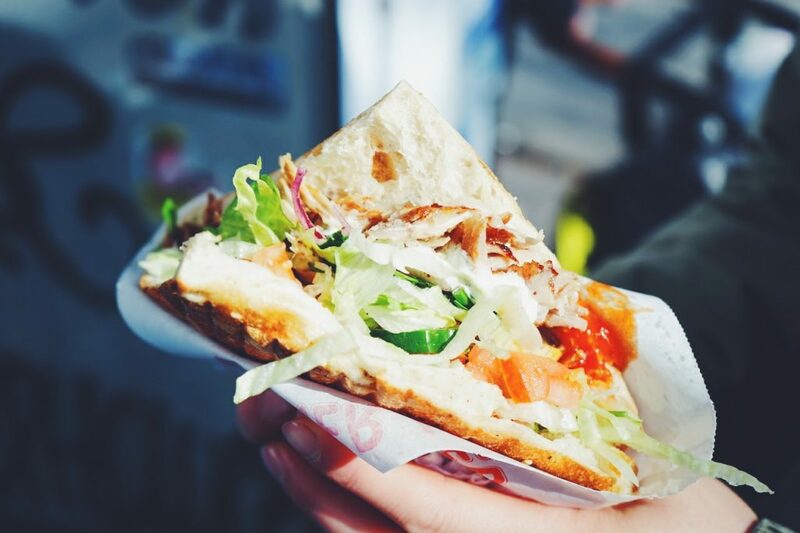 The Döner Kebab is the one true love and hate food of us Berliners. The fast food nobody really admits to eating, but yet all of us consume once in a while, especially after one of those Berlin nights with a few too many drinks. 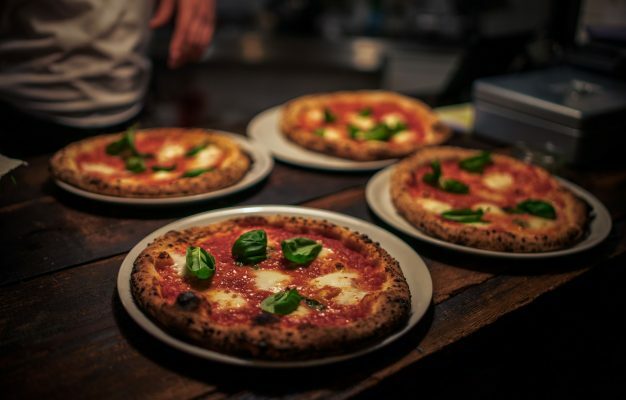 It’s a quick and filling meal and by far the most commonly available fast food commodity in Berlin, you can literally get it at every street corner in the city. There is really no other food (except the Currywurst) that Berlin is more known for and visitors always ask me for the best Döner in Berlin. It would in fact make more sense to replace the bear on the Berlin city flag with a Döner. There sure as hell are more Döners than bears around here. Interestingly enough, the Döner Kebab is in fact a modern take on the grilled, Turkish kebab and was allegedly developed in Berlin by Turkish immigrants after WWII. The story goes that in the 60s, the Döner developed into the most prolific fast food in Berlin and my city is by all means righteously called the Döner capital of the world. This is of course not true, since the concept of a “Döner Kebap” existed in Turkey long before that, but the Döner that we know in Berlin today, served with condiments such as salad and sauces, is most likely a concept that was developed in Berlin. 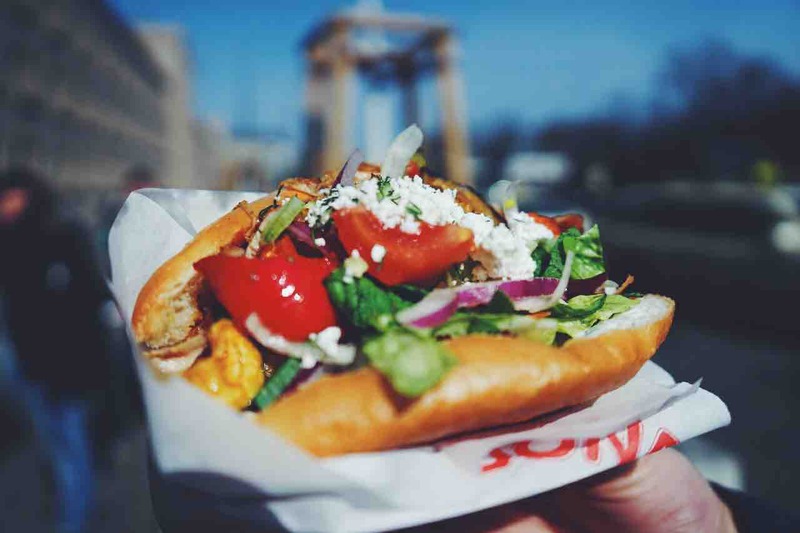 Today, the Döner Kebab stands in the shadow of modern food pop culture and trends like the burger hype and is a dish that definitely hasn’t been assimilated by the “hipster culture”. Which I personally really find to be shame, there is so much potential in the Döner and I’m just waiting for the first, smart entrepreneur to take our beloved meat sandwich to the next step and make something extraordinary out of it. Until that day comes, I will make your life easier by weeding through the hundreds of terrible Döners and guide you towards the few, very good alternatives. I’ve had plenty of Döners in Berlin and I’ve had plenty of disgusting ones whose consumption I regretted the moment I took the first bite. The quality of a Döner can easily be spotted by the meat used; if the big, fat meat stick doesn’t consist out of large pieces of meat, layered on top of each other, but rather out of a pressed, solid meat mass, I would strongly encourage you turn around and run. The meat quality is imperative for a good Döner. This list only judges Döners served in the classic flatbread, not in the dürüm wrap. The choice of sauces and condiments is all yours, between the choice of garlic, herb and hot sauce I always go for Kräuter (herbs) and Scharf (hot) and I always opt out of the red cabbage in my Döner and I still believe it’s just a humungous misunderstanding that we’re adding raw, red cabbage to our Kebabs, something that will eventually be corrected. Keep in mind that there are three “schools” of Döner in Berlin: Veal, older beef and chicken, where the meat decides the condiments and the seasoning. I’ll keep this list updated if any place pops up on my radar or any of the current places slip. Don’t be sad if your favourite Döner is missing, just send me an email and let me know who is missing. Doyum is my favourite Ocakbasi Turkish grill in Berlin and their ridiculously delicious meat skewers, grilled over charcoal, are simply to die for and something you have to try. They also offer a very solid Döner though that can be ordered to go, in contrast to the other food that has to be ordered in house. The Doyum Döner comes with great veal meat in a classic, toasted flatbread with a proper amount of tasty meat, the condiments are also classic and nothing extraordinary. It’s the one place on the top list that offers the condiment red cabbage, I always order mine without but that’s of course a matter of taste. What brings the Doyum Döner down is the overpowering sweetness of the sauces, with better sauces it would definitely be fighting for a sport in the top three. 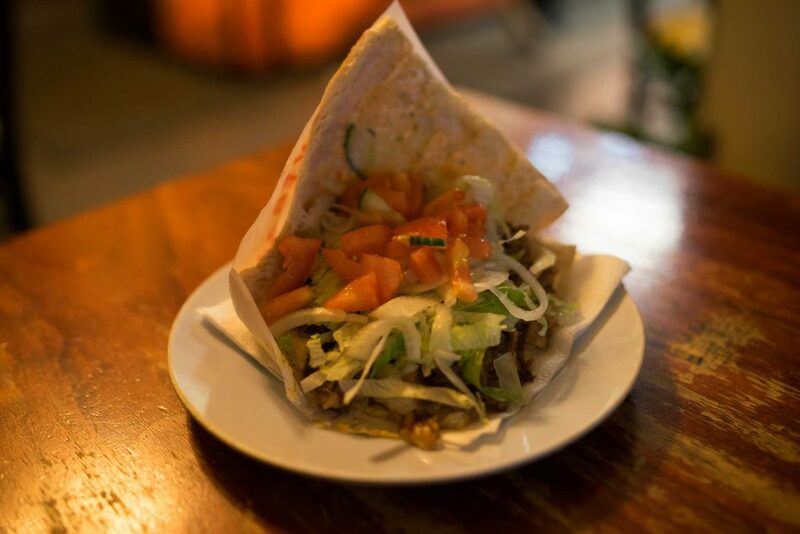 Pamfilya is hidden away in Northern Wedding and the newest member on the Döner top list. The classic Turkish grill on Leopoldplatz serves the whole range of grilled meats and the Döner Kebab is a truly great. It’s a “classic” kebab with veal meat in a flatbread and the normal condiments. I love the bread and the meat at Pamfilya and if it wouldn’t be for the slightly to sweet sauces it would score even higher on the list. One thing is sure, this is the best Döner in Northern Berlin. No Döner list is complete without Mustafa Gemüse Kebab and this one might just be the most famous Döner on our planet. I can’t really think of any other Kebab joint that has a website with flying Döners, their own commercial, over 20.000 Facebook fans and at any given time a line that stretches at least 50 m past the shop. It’s the Döner joint that is recommended by every single guide book ever written about Berlin and it’s on every tourist’s bucket list. So, is it really as good as every guide claims? Well, I’ve already answered the question, it’s really not the best Döner in Berlin. Ask the Turkish population about Mustafas and they usually laugh at all the people who are willing to stand in line for a Döner. In the end it’s a good Döner made with a lot of love, that’s for sure. The bread at Mustafas is unique and crispy, kind of like a mix between a pita and regular Döner bread. The Döner meat is chicken and the condiments are classic salad and onions/tomato with the very fresh and welcome addition of grilled vegetables. I’ve always respected Mustafas for their continuous dedication to details, despite the never-ending stream of tourists standing in line they never stop caring about their product. The cut meat is always seasoned extra with sauce and a spice mix and the whole döner is always topped off with some goat cheese crumbles and a squeeze of lemon. If just more of this effort would actually show in the actual product, they might even be able to get a better spot in this list, but it really doesn’t. In the end the massive line is a huge vibe killer, when you can get an Imren or Tadim Döner with zero waiting time it’s very hard to justify a 45 minute wait for an inferior product. 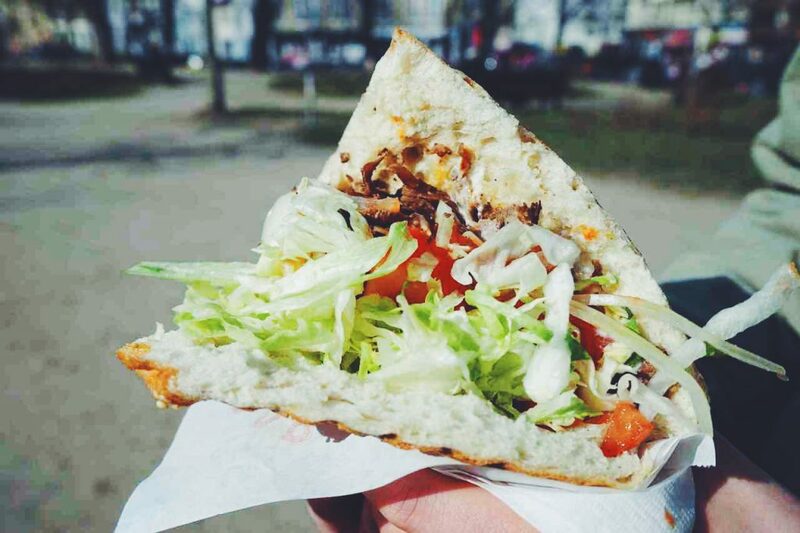 Should Mustafas Gemüse Kebab be on your Berlin bucket list? If you live here, probably. If you’re visiting, only without standing in line. Tadim is a Kreuzberg institution located right at Kottbusser Tor right among all the other, countless Turkish eateries. This one really stands out though and is also very popular within the Turkish population. They are famous for their delicious Lahmacuns, the “Turkish pizza”, which they make fresh and bake in their clay oven. But they are even more famous for serving a damn good veal Döner. The flatbread at Tadim is close to perfect and probably the best one I know, it’s thin and crisp and amplifies the experience of a light and airy Döner. The salad and the meat are very well proportioned and the sauces enhance the quality of the meat instead of overpowering it. Where the Tadim Döner always convinces me is in terms of texture, it’s crunchy, juicy and everything you want a Döner to be. It’s by far the lightest and freshest Döner I know and just scrapes by the number one position due to inferior meat and sauce quality compared to Imren. But there are some elements I prefer at Tadim though, and I’ve often woken in the middle of the night, dreaming about the perfect Döner: A Tadim bread with Imren meat and sauces and Tadim condiments. One day I will have to turn this dream into reality. 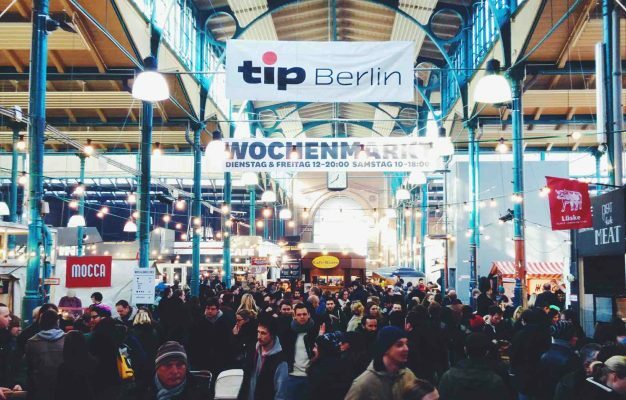 Imren is a Berlin döner institution that’s been around for over two decades. Located in Neukölln right off Hermannplatz, this place has a reputation for exceptional meat quality among the Turkish population in Berlin. A taxi driver once passionately described to me how the meat at Imren is so tender since they marinate it in milk. True or not, it is indeed the quality of the meat, along with great sauces, that make Imren’s döner stand out from the competition. The bread at Imren is good, the condiments classic iceberg salad, onions and tomatoes very classic. This Döner is really also not the prettiest, quite the opposite actually, but this is very much compensated by the exceptional quality and consistency of the meat and the fresh sauces. The hot sauce is spicy as hell and the herb sauce is fresh and vibrant and not as sweet as those of the competitors. Imren is really one of the very few places where I actually love the Döner sauces. The meat is by far the best Döner meat in Berlin, it’s actually so damn good that it’s not really comparable to other options. It’s full of flavour and every bite of a Imren Döner is one way ticket to the Middle East that will make you question most of your previous Döner choices. Imren is the best Döner Kebab in Berlin a shining star in the vast galaxy of Berlin Döners. 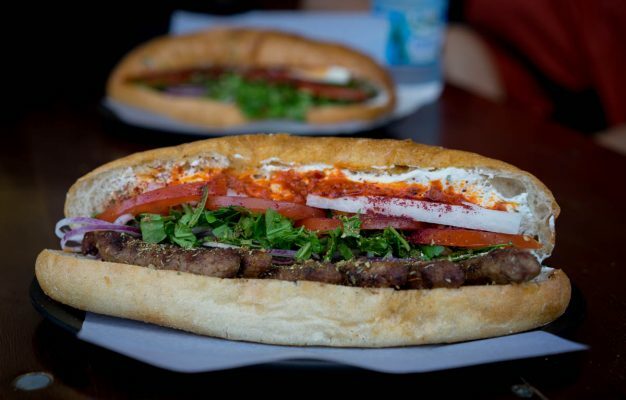 A visit here might just redefine your whole Döner game.